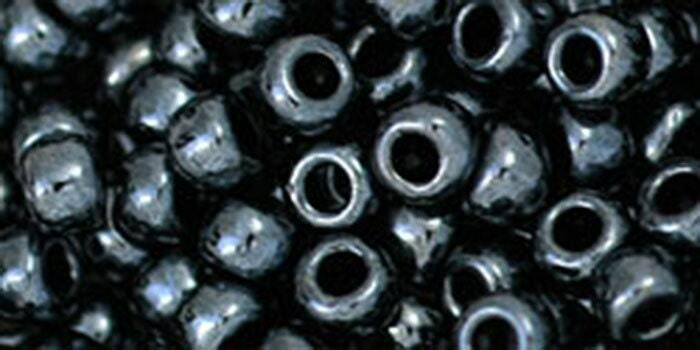 Metallic Hematite 6/0 Toho Rocaille glass seed beads. 8 grams of beads in a 2-1/2 inch tube. There are approximately 18 beads per gram, depending on the color and finish of the bead. Measurements: 6/0 Size - Approximately 3.3mm in diameter. Toho 6/0 seed beads are a larger seed bead and can be great used as spacers between beads in stringing because of the uniform shape and roundness. They can also be used on larger threads and yarns for knitting, crochet and weaving. Toho beads are designed to have a larger hole that allows for even more passes through for threads. The larger hole (about 1.8mm) also creates lighter beads which give you more beads by weight. Consistent size, shape and quality! I know I am repeating myself...but I am running out of adjectives. These are so pretty...Really! Thank you for gorgeous beads!